More power? Check. Better traction? Definitely. 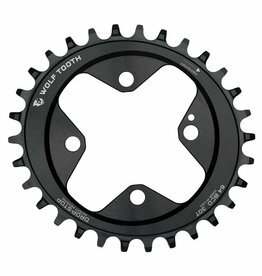 Less shifting? Yup. Funky uneven pedal stroke? 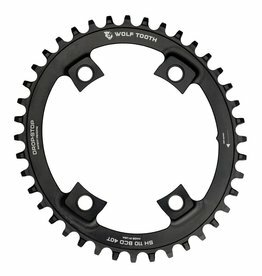 Not with Wolf Tooth’s PowerTrac Elliptical™ (PTE) chainrings. 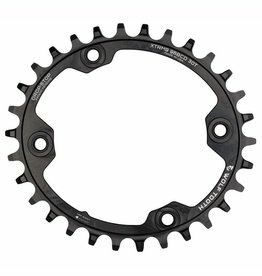 Our proprietary design means a slightly less ovalized ring with less aggressive timing than competitors’ versions; any change to your pedal stroke is unnoticeable for most riders, but they still provide the power and traction benefits inherent to elliptical chainrings. 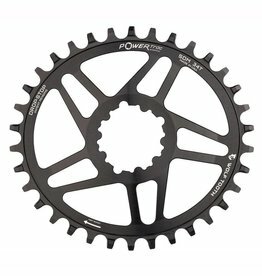 PowerTrac Elliptical™ rings feature 10% ovality, combined with 112° timing, which is measured after the Top Dead Center (TDC). This means that with PTE rings, the larger-diameter section of the ring engages with the chain at the optimal point on the downstroke, or “Power Zone,” to take advantage of your body’s natural biomechanics. 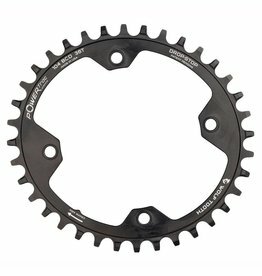 So while your pedal stroke will feel smooth and natural, you’ll get better traction and acceleration with PTE rings: It’s like having two chainrings in one! But how exactly do they accomplish this? 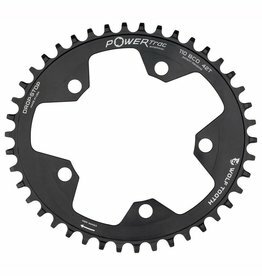 Here’s the simplest way to explain it: Your pedal stroke is biomechanically weakest when your pedals are at the top and bottom of the circle (around 11:00-1:00 and 5:00-7:00 on a clock face), in what we call the “Recovery Zone.” The ovalized shape of PTE rings means has a smaller diameter when the chain engages in this section and will actually function as if you had TWO FEWER teeth – think of it as an instant gear change to an easier ring, say from a 34t ring to a 32t! They work the same way in the Power Zone of your stroke – when your front pedal is between 1:00-5:00 in our clock analogy. Here, where your legs are their most powerful and efficient, the PowerTrac Ellipticals have a larger diameter and function like they have TWO EXTRA teeth, say from a 34t to 36t. 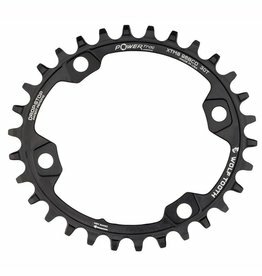 In both cases this works because, with the radius of the chainring constantly changing, the torque needed to turn the cranks is constantly changing as well to better match your power output. But how does this help traction? The above features combine to provide a smoother, more efficient pedal rotation. This provides steadier torque on the rear wheel, so you’re less likely to over-pedal in the Power Zone and spin out. It also makes pedaling a bit easier during the Recovery Zone, so you maintain momentum. 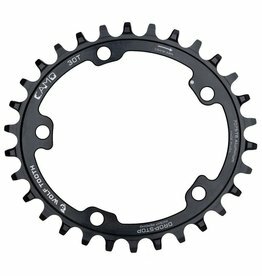 This “two-chainrings-in-one” effect keeps pedaling smooth and torque constant through each revolution. 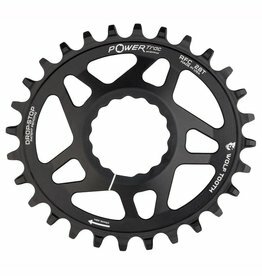 We offer PowerTrac Elliptical™ rings in a wide variety of sizes to fit all major brands’ cranks. Just pick your size and configuration, order, install, and start pedaling as normal – your new oval rings will do the rest!